See the bottom of the post for the answer. Pictured below is a mortuary temple built for a female king. She was one of our mystery country’s most successful rulers, reigning for over 21 years. After her death, her successor had her image and name stricken from most monuments. Although she lived 3,500 years ago, she was lost to history until modern times. Life along the banks of the river pictured below has changed little in thousands of years. In ancient times, the river’s predictable annual floods left behind rich silt deposits, which made very fertile lands for farming. This was the basis of the powerful, sophisticated civilization that thrived along these banks for thousands of years. Visitors can cruise the river for several days and enjoy timeless scenes of everyday life along the way. The stepped building of the complex below is a prototype of its more famous descendents, which stand about 15 miles away. This site was a necropolis for one of the ancient capitals of our mystery country. This week’s mystery country is EGYPT. CLICK to see Egypt tours and Nile cruises. Clue 1 – The Temple of Hatshepsut, across the Nile from Luxor, near the Valley of the Kings. 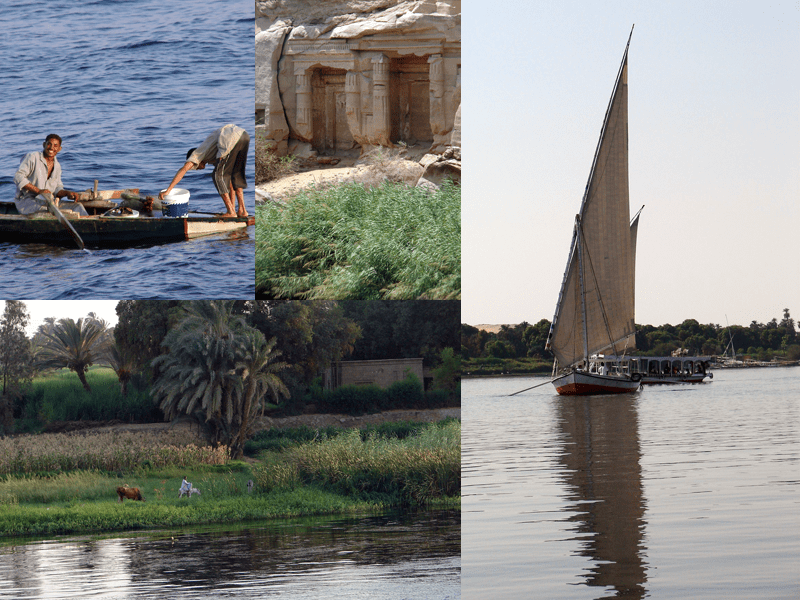 This site is generally included in Nile cruise itineraries. 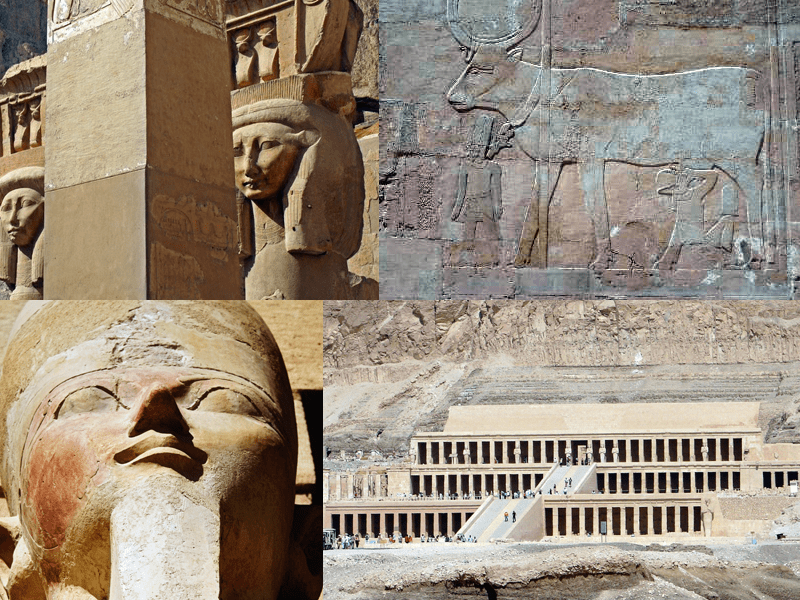 CLICK to read our post about Hatshepsut. Clue 2 – The Nile River. Nile River cruises travel between Luxor and Aswan and include escorted touring stops at major sites along the way. Clue 3 – Sakkara (Saqqara), the necropolis of the ancient Egyptian capital Memphis. The Step Pyramid there is a prototype of the pyramids at Giza. 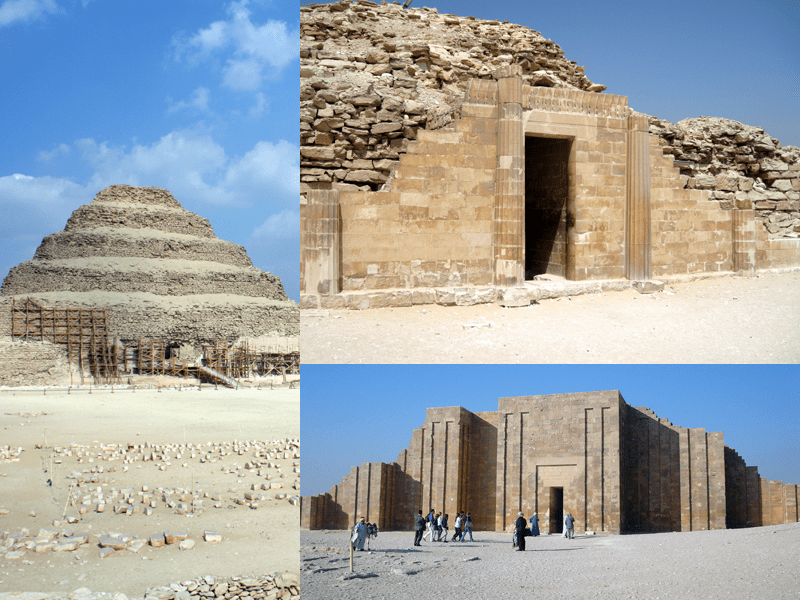 A visit to Sakkara is generally included in Cairo area touring. 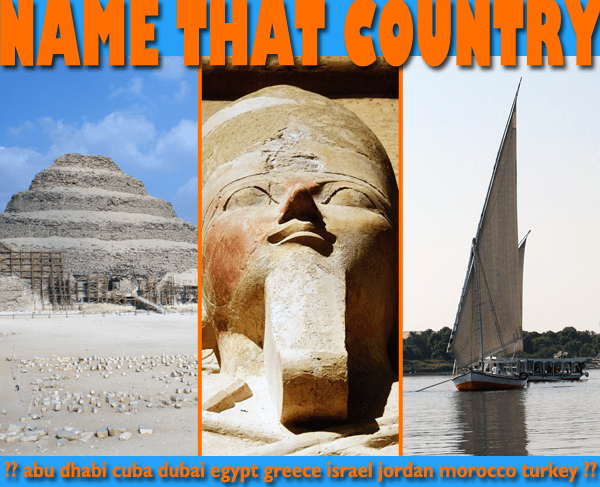 This entry was posted in name that country quiz, Uncategorized and tagged Cuba, Egypt, Greece, Israel, Jordan, luxor, Morocco, nile cruise, nile river, Oman, sakkara, saqqara, Temple of Hatshepsut, United Arab Emirates, valley of the kings by yalla2013. Bookmark the permalink.